Mostly, but not entirely, about cooking, eating, drinking, markets, festivals, exploring and glorying in life in general in this lesser-known part of France (and in other parts of the planet). Apples, juniper and sage--and where they come from. That sprig of sage is from the huge bush in the garden, grown from a cutting given me four years ago. Trying to avoid the prickly spikes surrounding them, we picked the juniper berries in Provence last October when we visited Jean-Marc and Annick. 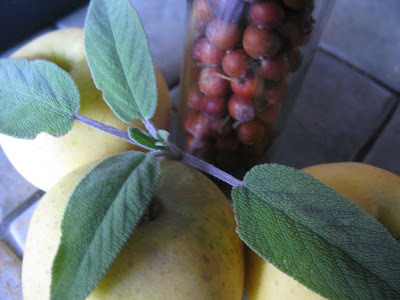 Months later, the colours are still gorgeous, and opening that little glass jar unleashes a heady smell of gin. Yesterday, I bought a 2 kg bag of Chantecler apples in SuperU which, like most supermarkets here, strongly supports local producers and growers. These pommes grew in Cazals des Bayles, about 20 km away. Guess what I found in Léran! More days than not, I go for a walk through some part of our village. Sometimes it's just down to the halles to buy a baguette. Other times it's because I've been writing all morning (or afternoon) and need a break. Often it's out into the open countryside all of five minutes away, or along by the river. Almost always, I see something new. It could be a tiny passageway that threads between houses, or a date carved in stone over a door, or simply the changes in the seasons. But rarely is it as good a surprise as this. 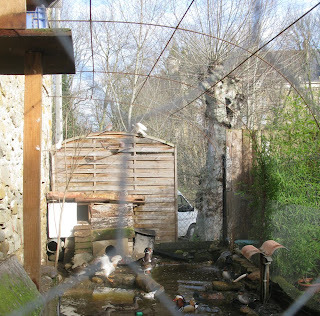 A duck pond with chateau view, sandwiched into a little gap down by the river. Apologies for the quality of the image. 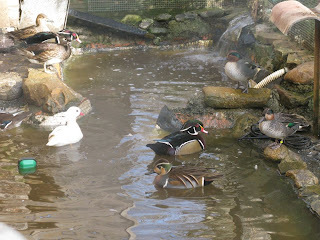 To be honest, it's not that photogenic a pond but I was delighted that it even exists. Here's a closer look at the ducks. What I'm wondering if whether they're kept as pets or....? After all, this is serious confit and foie gras country. Two recipes that taught me to love endives. For as far back as I can remember, I've been ambivalent about endives. Chicory, witloof, those little pale green torpedos that come at you under various names. On the one hand, unlike loose floppy lettuce leaves, they don't need much hands-on work, if any. On the other, they can be unappealingly bitter. The most I can say on their behalf is that they can survive in the fridge, unloved and unused, for a long time before turning slimy. The other thing is that, this time of year, they're cheap. And my OH is a huge fan of them. Endives do occasionally find their way into a salad but mostly all I've done is wrap them in ham. bathe them in a mustard-zapped cheese sauce, and top the dish with grated cheese--usually Cantal--before bunging it in the oven. Then, about a week ago, one of the Sunday papers published a piece by Hugh Fearnley-Whittingstall on how to use up your Christmas leftovers--and he wasn't talking about turkey. What appealed to me was a pasta dish. Any dish I can make from memory after a trial run is a keeper--and this one definitely is. For two people, you need two endives plus about 50 grams of pitted black olives. Chop both of these roughly. Once you've put your pasta into merrily boiling water, heat a couple of tablespoons of olive oil, and throw in a finely chopped clove of garlic. Give it a couple of minutes, then add the endives and olives. Stir it around until the endives have wilted but still have some crunch. Mix in two or three tablespoons of crème fraîche (sour cream would do, I reckon, or even ordinary whipping cream, just something naughty). Toss pasta with sauce, strew with plenty of grated Parmesan. I know this sounds easy but it's honestly far better than the sum of its parts. Next up, a terrific salad from Thomasina Miers. This looked so scrumptious when I watched her make it on Food Network UK, that I tried it a few days later. The original calls for large, costly scallops. I've since tried it with prawns and it works. I think monkfish would be fine too, and probably skate, each cut into scallop-sized chunks. I've even made it without fish and it's still good (if you take this route, halve the marinade quantities). Here's my version of her recipe. This makes a lunch or light supper for two, though you might want to add a baguette. In a small frying pan, dry roast the cumin, coriander and chili flakes till fragrant. Mash the garlic clove in a mortar, and pound in the roasted spices. Add 2 tsp of the olive oil, and the salt, and keep pounding till you have a thick, smooth-ish paste. Toss the prawns in half this marinade and leave them for a couple of hours if you can. If you can't, let them sit while you get the rest of the ingredients ready. Cut the skin off the orange, and remove the flesh in tidy sections. Squeeze the remains of the orange into a bowl. Whisk in 1 Tbsp olive oil, and the other half of the marinade. Break the endives into separate leaves, add the orange, toss with the dressing, and divide into two bowls. Heat a frying pan, and add what's left of the olive oil. Stir fry the prawns just until pink. Divide them between the salads, along with the avocado chunks. Sprinkle with coriander leaves. 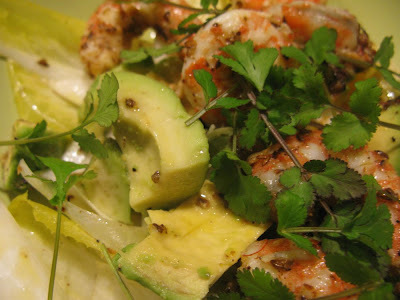 This really hits the spot: the sweet spiciness of the prawns, the fleshy avocado, crunchy endive, and tangy orange. Try to get some of each in each bite. Get all your prep work done beforehand and it comes together in minutes. 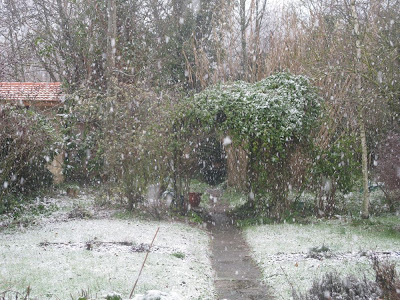 As seen through the kitchen window: our garden a couple of hours ago. Those large, drifting cotton-wool flakes have now turned to rain. It's an ideal day to be indoors with trips to plan, emails to write, books to be read, the fire lit and delicious-smelling pans simmering away. Those who know me well know that I'm just as passionate about crafts as I am about cooking and eating. It's total joy having more free time than I used to because it means I've been able to set to with my knitting needles and begin to consume a yarn stash that literally fills an entire armoire. A true cupboard of delights. it's crammed with gorgeously coloured skeins collected over the years in the UK and in North America. I've bought from yarn shops, from thrift stores, from flea markets, and even recycled wool from secondhand sweaters and cardigans that I've ripped apart. In the unlikely event that I do ever run short (and even if I don't) I can sleep at night knowing that I have an extraordinary source right in my neighbourhood. Specializing in lusciously soft wools tinted with natural plant dyes, my friend Andie Luijk runs Renaissance Dyeing http://www.renaissancedyeing.com/en/ in Lieurac, a hilltop village on the back road to Foix. Want to mend the rips in a medieval tapestry, or knit a pair of heirloom socks? She's the person to turn to. Among the many French crafts magazines, Marie-Claire Idées is probably the most inspirational. 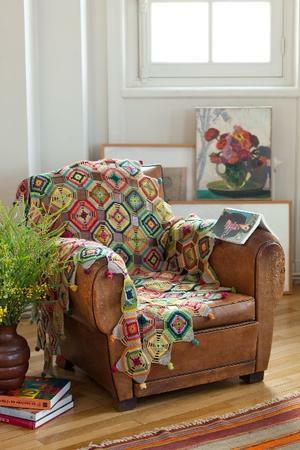 A couple of copies ago, an entire page featured the most gorgeous blanket crocheted from Andie's wools. It's available as a kit and, if you're tempted, know that she send mail orders all over the world. It took me a long while to feel comfortable with the idea of cooking non-French food in France. God knows why but it was as if being here meant that, to the exclusion of all else, I should immerse myself completely in duck, foie gras, daubes, grilled fish, ratatouille and all the other dishes that you flash on when you hear the words "French cuisine". Backing up a bit, there's a terrific organization in France that provides help and support to English speakers with cancer. In our house, we're so, so lucky that we don't need their assistance, but what we can do--and it's not entirely altruistic--is go and buy books by the dozen when their travelling stall comes to the village every couple of months. This past Saturday, I managed to get my hands on a few cookbooks, including Rick Stein's Seafood Lovers' Guide, which includes a couple of must-trys: an omelette Arnold Bennett (made with smoked haddock, cream and parmesan) and devilled mackerel with mint and tomato salad. And then there's the recipe for salt and pepper squid. Light, fresh, zingy, just the thing for post-holiday appetites. In the UK, or in any large North American city, you could pick up all the ingredients you need year round. Here, in la France rustique, it's more of a safari, as well as thinking on your feet about what can stand in for...I dunno...bean sprouts. 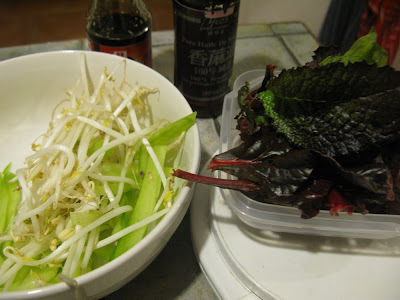 But there bean sprouts were at Mirepoix market, a bowl of them on a little stall near the Indian restaurant. Elsewhere, long vividly scarlet peppers from Morocco looked piquant but I checked, and the stallholder said that they were. No surprise that there was no watercress anywhere, so I forgot about that for the moment but I did find the necessary cucumber and green onions at SuperU. However, the only "squid" at the fish counter were large white oblongs obviously cut from the tentacles of some colossal denizen of the deep. So, mea culpa, I bought the frozen kind, tubes, all cleaned and ready to use. Back home, I started thinking about what I could substitute for watercress. Any green really with flavour and crunch. The vegetable beds in the middle of the lawn are almost empty at present apart from a spectacular resurgence of fennel. Not the right taste but the red chard plants that keep producing and producing would do. I thought I'd ripped up the last of the Asian greens but one mustard variety survived. Altogether, I had the necessary 50 grams (see top right) of greenery to go with the cucumber and bean sprouts, all to be dressed with soy sauce, sesame oil and a dash of sugar. Squid takes only minutes to cook. As instructed, I pinecone-cut, then flash fried, them in two batches, before adding lots of chopped red chili and green onion. The squid and salad are meant as a starter but adding rice turned it into a meal. Definitely a keeper. Back sometime in December. Rainy, slate-grey skies, bitingly cold...why would I take my camera on a day-trip toCarcassonne when the plans were just to have lunch, shop and drop a friend off at the airport? Lunch first. The Carcassonne you think of when you hear the name is the ancient walled Cité. It may be riddled with tourists most of the time, but it's surprisingly full of decent, affordable places to eat. Unless you're in the market for plastic swords and helmets, you're better off shopping in the lower town, sometimes called the "new" town because it only dates back to the 13th century. 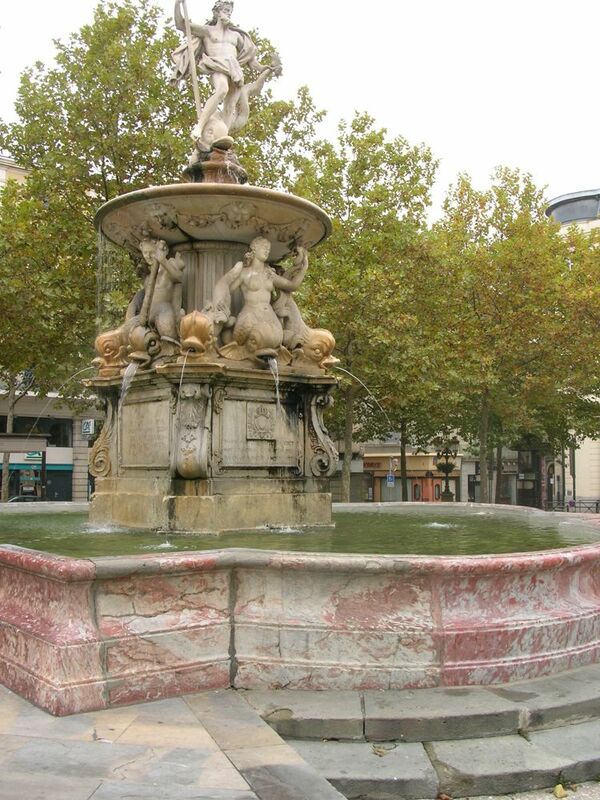 Place Carnot is its centre. A square that's just the right convivial size, it was currently being made ready for Christmas festivities with chalets and an ice rink. Fake icicles hung around the fountain in the middle (this shot was obviously taken earlier in the year). At some time or another, we've eaten our way through most of the cafés and restaurants around it but this was our first venture into Le Saint Roch. What sucked us in was the menu posted outside. It was a chilly day so we were ready for the full three courses. My entrée was a miniature paella pan--about the size of a tea-plate--holding an egg "Catalan style" on a base of cooked tomato, peppers and onion. Two orders of gesiers salad, prepared a little differently "very, very tasty," (I'm transcribing as he speaks). Samosa filled with spice-inflected tuna (and that side salad) were described as "the best samosas in France." Not sure if that's damning with faint praise though for someone who just arrived from Asia. On to the mains. I'm obsessed with seiches at the moment. Two fat ones, perfectly cooked a la plancha, came with roasted potatoes and a scoop of sweet potato purée. Those who had ordered the steak and duck confit got the same veg. A commendable pear-and-chocolate crumble to finish with rather too much whipped cream drizzled with chocolate sauce at its side. Snuggly knees with your vin rouge.